children's activities; educational games, arts and crafts, printable material. Circle time is ideal for getting children to exercise. Use this time to introduce the week's theme: the circus. Play the role of the animal trainer. Children are the circus animals. Here are suggestions of thematic exercises. Have children stand and walk together in the same direction around your circle time area. Name a few circus animals. Say, "You are tigers." Children crawl about like tigers. 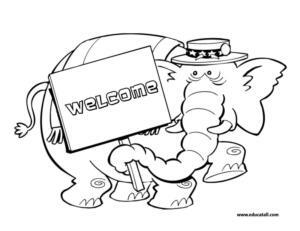 Say, "You are elephants." Children walk slowly, stretching out their arms and legs to make themselves as wide as possible. Next, state, "You are beautiful horses." Have them walk holding their head up high, arms alongside their body. When children are used to the game, have them jump through hoops, raise one leg, etc. Variation: Once children understand the game, give each child a different circus animal to represent. Your circle can have a horse, a tiger, an elephant, etc. Claudine, one of our collaborators suggests an imaginary game to begin each day. (Open thematic letter - Pipo the clown) Print the letter. Prepare a shiny envelope. Place the envelope in an easy to find location in the daycare. Read portions of the letter to them each day. 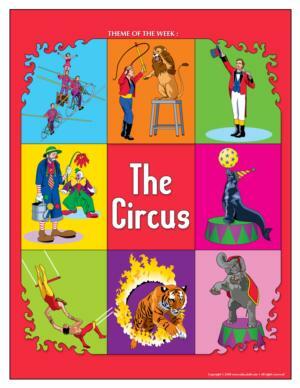 (Open thematic poster-circus) Print, laminate, and decorate the walls of your daycare with all kinds of posters. Organize a circus corner. Install mats for trapezists (children can use them to pretend they are acrobats throughout the week). Add balls and scarves for juggling, hoops, makeup, clown costumes, hats, disguises, a mirror, and a clown nose. Here are a few workshop ideas for this theme. Building blocks - Construction area: Blanket or parachute to create a large tent. The pictures may be used as a memory game or to spark a conversation with the group. Use them to decorate your daycare or a thematic corner. 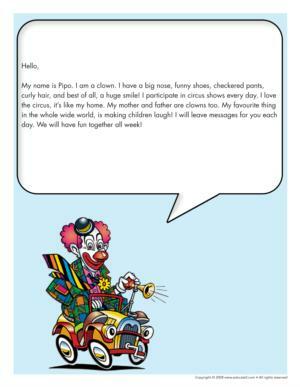 (Open picture game-Circus) Print, laminate, and store in a "Ziploc" bag or in your thematic bins. Children sit two by two. Place mats on the floor. One child lies on the mat on his stomach. The other child uses a ball to massage his back. Play relaxing music throughout the activity. Provide children with makeup pencils and mirrors. Let children paint their own faces to resemble circus animals or clowns. Have lions jump through hoops. This activity may be done indoors or outdoors. Children stand single file and hop, one at a time, through the hoop you are holding for them. Once all have had a turn, raise the hoop. Add words of encouragement such as, "Come my beautiful lions!" Continue raising the hoop, then alternate between high and low. One child plays the role of the trainer and stands with his back to the rest of the group at the opposite end of the daycare. The rest of the children are elephants who move in a line towards their trainer. From time to time, the trainer turns around. The elephants must immediately freeze. If an elephant moves, the trainer names him, and the child must sit down until the next round. Stretch a long rope out on the floor. Invite children to imagine the rope is high up in the air. Children walk barefoot on the rope. They mustn't put their two feet beside the rope if they do not want to fall! There are different ways to walk on the rope. Have them walk backwards, hop on the rope, and crawl on the rope. 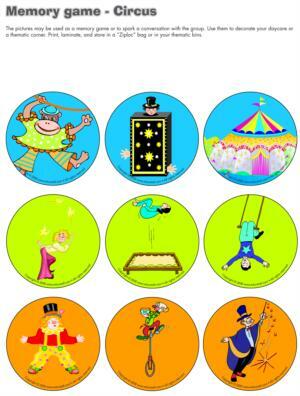 (Open games - Circus memory game) Print cards twice. The cards may be laminated or put in small "Ziploc" bags to protect them. Place cards face down on the floor. One at a time, children pick two cards. If they match, they keep the cards and play again. If the cards do not match, they must replace the cards. Their turn is over. Build a tower of objects or have children walk while balancing an object on their head. You be the judge of how sweet you will go depending on the age group under your care. At the circus, there are sweets galore! Small bags of popcorn, candy apples, cotton candy, and sausages are examples of treats you can enjoy. Try turning your kitchen area into a sweet treats canteen. Children can choose their favourite item! Prepare a round pizza for each child. Create a clown face using vegetables for eyes, a nose, and a mouth. Add spaghetti for the clown's hair. For each child, put one scoop of ice cream in a bowl. Add an upside down cone on top of the scoop. Have children create their clown faces (the scoop) using small candy. (Open model - Circus hat) Print and trace onto coloured cardboard. Have children cut out and decorate their circus hats. Measure children's heads and staple closed. Provide children with Styrofoam balls to paint and decorate with sparkles. Thread string on a needle and push through the ball. Tie behind children's heads. (Open activity sheet - Clown face) Print the face outline. Children add the expression of their choice. 1, 2, 3, 4, 5...the circus is live! Have you ever seen a circus? Sung to: Have you ever seen a lassie? Makeup, costumes, jumping rope, hoola hoops, balls, soft balls, mats, balance beam, balancing pole, parachute, ribbons and balloons for decorating, musical instruments. Use a parachute to create a big top. Decorate with ribbons, streamers, and balloons. Create a balance beam with a 2 x 4 and cover it with red adhesive tape. Cover a long stick with red adhesive tape too. Use it as a balancing pole. Children can walk like tightrope walkers. Provide mats for clowns and acrobats. Lion tamers can make use of the hoola hoops. Emily was going to spend the day at the circus with her friends. When they arrived, they were told that all six clowns were sick and that they could not be in the show. Emily and her friends thought that, if they practiced, they could be the clowns in the next day's show. Show children new words (big top, tightrope walker, juggler, etc. Sing songs using gestures and movements. Continue with: elephant trunk, balancing pole, etc.